Last winter I saw the King of Rock ‘n Roll. It’s pretty hard to believe that he’s still alive, let alone still performing, but it’s true. Once a month Chuck Berry plays a concert at a place called Blueberry Hill here in St. Louis. It’s a kitschy restaurant full of dusty memorabilia cases and old arcade games. There’s two bars, one upstairs and another in the basement which is called The Duck Room. Named after Berry’s signature dance move (you’ve seen it even if you didn’t know what it was called, Michael J. Fox does it at the end of BACK TO THE FUTURE) The Duck Room is not a glamorous place, it looks exactly like the basement of a restaurant. Only with a bar and a funny ha-ha duck decor. Blue Berry Hill has quite a few concerts down in the Duck Room, I’ve seen a few acts there–but the only time I’ve ever seen the place sell-out is when Chuck Berry plays. Usually The Duck Room is a standing-room-only affair, but for Berry they owners brought out a few crappy chairs. The audience was mixed, young and old, there were more than a few people pushing 70 in the crowd. Which seems about right considering Berry himself is 85 years old. A serviceable cover band opened the show (sorry I can’t remember their name) and once they finished, Chuck Berry’s band, which consists of his children and family friends, took to the tiny stage. After a little intro music a very tall, very spry man shuffled up onto the stage. He was wearing a white captains hat and had a guitar. If you’ve ever seen a picture of Chuck Berry, from any year, then you know what he looks like to this very day. It’s amazing how some people age…and how others don’t. I’d like to think that in Berry’s case, it’s rock ‘n roll that’s kept him young. Seeing Chuck Berry play songs like “Sweet Little Sixteen,” “No Particular Place To Go,” “You Never Can Tell,” and yes “Johnny B. Goode,” was akin to the times I saw Paul McCartney and The Rolling Stones. It still doesn’t feel real to me that I’ve been in the same room as them. And as amazing as they were, Berry is in a whole class to himself. Open up Keith Richards (excellent) autobiography LIFE. Go ahead, open up that massive book to just about any page and chances are you’ll see Chuck Berry’s name–he talks about Berry endlessly. I’ve read more than one rock biography or interview where Berry’s name was spoken as though he were a living, breathing God. We sort of take it for granted now, but once there was a time when there was no rock music. White people liked really boring big band music (or whatever) and black people played blues music for each other. Berry didn’t invent rock ‘n roll, that suggests that he plucked it out of thin air or that it’s components didn’t already exist. No, Berry took rhythm and blues music and he distilled it like Jack Daniels, into the potent concoction we know today. It’s pretty amazing that Berry is still alive and even more amazing that he still performs regularly. I feel honored to live in the same city as the man who changed pop music forever. The rest of St. Louis feels the same way because recently a monument was built in Berry’s honor. 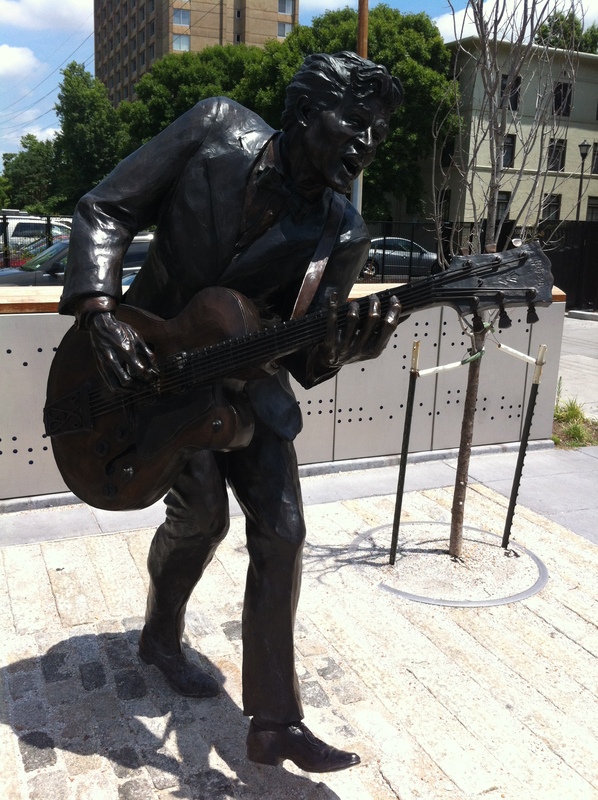 Located directly across the street from Blueberry Hill (and a stones throw from Vintage Vinyl, the city’s best record store), the monument features Berry’s lyrics carved into the ground, an illuminated wall that displays the musical notes for “Johnny B. Good,” and an 8-foot bronze statue of the man himself. All hail the King of Rock ‘N Roll! Long live the king. Nice. I saw him sometime in the 90’s in New York. It’s great to know he’s still performing! I know I am just astounded that he is still able to perform. It’s also amazing when you consider the fact that he’s outlasted most of “second generation” of rock stars (the people he influenced). Thank you. You have paid a great tribute to my dad and his music. Thank you for the comment. I consider myself very lucky to have been able to see him perform.